The rent at Campus Crossings Brightside Apartments ranges from $925 for a one bedroom to a $409 four bedroom. Apartments in this building are about 50% less expensive than the Highlands-Perkins average. This is a pet-friendly apartment. 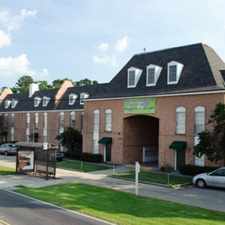 This apartment is in the Highlands-Perkins neighborhood in Baton Rouge. The closest park is Leeward Park. Campus Crossings Brightside Apartments has a Walk Score of 42 out of 100. This location is a Car-Dependent neighborhood so most errands require a car. STUDENT LIVING - PRICES PER BEDROOM. Campus Crossings Brightside is located minutes away from LSU. Ride the shuttle to class and come home to relax and sun yourself in our stunning play action pool. We offer 1, 2, 3 and 4 bedroom units that are the best value for students in Baton Rouge. Take a tour or inquire for more information by clicking to email us below! Rental rates are per bedroom per month. Explore how far you can travel by car, bus, bike and foot from Campus Crossings Brightside Apartments. Campus Crossings Brightside Apartments is in the Highlands-Perkins neighborhood. Highlands-Perkins is the 6th most walkable neighborhood in Baton Rouge with a neighborhood Walk Score of 36.